The SilverShield Control is an Android App, that can be used to control the SIS-PMS. 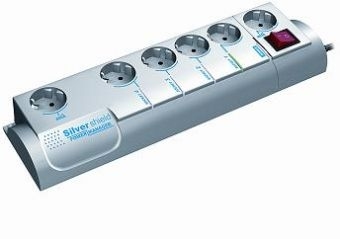 The SIS-PMS Silver Shield Programmable Power Outlet Strip is a power strip that can be controlled via USB. I use it myself to control the power of some devices in my home office, so that I can just turn them on when I want to use them. The Silver Shield is connected to my server which is also acting as a NAS, TV recorder, DLNA server and scan server. In order to save some power, I setup that I could remotely turn on/off the different devices whenever I needed them. My problem was that sometimes I didn't have a computer close by when I wanted to turn some of the devices on. Ex. when you are in the TV room, and want to watch a movie you recorded on one of the external hard disks (That are turned off). The solution was to walk to the home office and startup a computer, or login to the server and turn the power on. Being tired of doing this every time I wanted to use this, I decided to create an App for my android phone. BTW, the effect of grabbing your phone and turn on the light, certainly make some people look.